So: you have an autoimmune disorder, and you also have a strong history of stress or past trauma. Perhaps you’ve taken the ACE test, or filled out your personal timeline, as explained in part one. Maybe you feel overwhelmed. And more than a little bit lost. Because I knew my first article would raise many questions for you, I have rounded up some tried and true therapies suitable for survivors of trauma. You can use these as part of your personal mental health tool box to aid you in your recovery with unresolved emotions and autoimmune disease. Some of these methods may seem overwhelming if you are already dealing with symptoms of an autoimmune disease. However, the journey to recovery is a marathon, not a sprint. I don’t expect you to try everything at once – in fact, even if you only do one thing on the list, it is a step in the right direction! After all, you’re reading this article because you know you need to make a change. And if you haven’t filled in your personal timeline, I recommend that you do the exercise before attempting anything below. 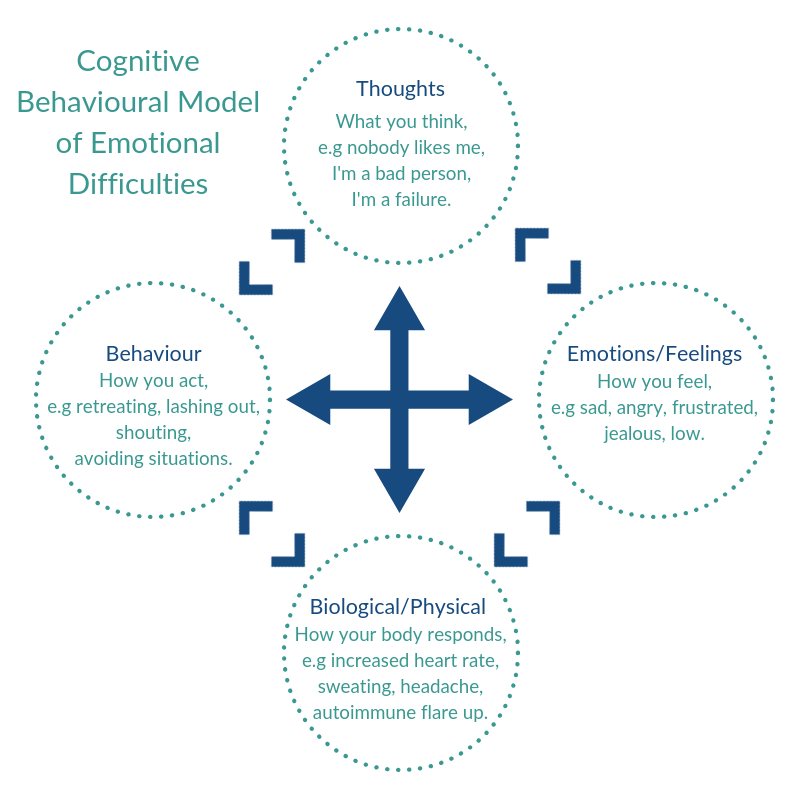 The diagram shows how your thoughts, feelings, behaviour and physical health affect each other. Thoughts such as “I’m not safe”, “I can’t trust anyone”, or “I need to go it alone” not only affect your emotions for the worst and lead to poor behaviour socially and physically, but they also have a physical impact on your body. These thoughts may result in extreme anxiety symptoms such as intense breathing, heart palpitations, and an inability to sit or relax. If you have an autoimmune disease, these thoughts have a real bearing on your health. All aspects in the model affect each other, so an autoimmune flare up may bring up more bad feeling and low thoughts. It may even result in poor behaviour on your part, such as deciding not to care for yourself, because you don’t see the point, and you feel very low. The process can leave you in a vicious cycle, with grave results for both your mental and physical health. It is helpful to keep a diary of these low thoughts, as while it is painful to do so, it’s the best way to notice if there are any patterns in them, triggered by current stressful events. These negative thoughts can have an impact on your physical health, your mental health, and the way you live your life. Thoughts like the above are referred to in CBT as your bottom line. Your bottom lines are feelings that have been reinforced from an early age, but they are not true. The thoughts are examples of biased thinking. You are a wonderful individual with so much to offer the world – yes, even if you are struggling with a chronic illness! But the only way to truly challenge these thoughts is by figuring out your rules for living. What Are Rules for Living? If you experienced adverse childhood experiences, it may not come up in your daily life, but you may find you repeatedly think negatively or poorly of yourself. The negative thoughts can be crippling and exhausting to experience every day, but they also reinforce your rules for living. Rules for living are another concept from CBT, which describes the belief system you put in place as a young child. While bottomline beliefs can be cruel, rules for living help us get on with our lives. Rules for living help us feel alright with ourselves – as long as we obey them. Ultimately, it is a belief system that desperately needs updating for a happier, healthier you. If you are an adult that experienced emotional neglect from a young age, you have not been taught how to regulate your emotions. Emotions may scare you, whether they are other people’s or your own. I should never make a fuss. I must never lose my temper. I must always be nice. I must put other people’s emotional needs first. None of these rules sound like a realistic way to live your life, do they? It’s impossible to go through life not feeling emotions, and especially tough to never lose your temper. However, the rule or similar rules were set up by your younger self as a form of protection to get you through a hard home or school life. Your rules for living are rigid and linked to powerful emotions, making them hard to break. The rules are extreme, and often based on the impossible. It’s important to find out what your bottom lines are, because usually you have more than one – because you have more than one repetitive negative thought. Once you identify your bottom line, you can find a new healthier rule for living to replace it. But you need to drill down and start asking yourself some difficult questions. Situation: My group of friends had a gathering, but didn’t invite me. Emotions: Sad, angry, upset, self-conscious. What do you mean when you say you are unlovable? That I’m not a good friend and I’m difficult to love. And if that was true, what does it mean? At some point my friends and family will realise it. And supposing they did, what would that mean to you? I would lose my friends and family – I’d be alone. I can’t afford to make a fuss about not being invited – I don’t want to be seen as difficult. I don’t want to be found out as hard to love. I should never make a fuss, I must always be nice. Give yourself time to drill down from your bottom line to your rules for living, and a little longer to challenge these rules. But rest assured that CBT is a tried and tested way to improve your mental well-being and potentially improve your immune system. Less rumination on your problems improves your health – rumination can make autoimmune disorders such as fibromyalgia worse. Ultimately, if you find self guided CBT overwhelming, it may be time to find a therapist who specialises in trauma based CBT, or another mental health professional who can guide you through the thoughts and feelings that thinking about your trauma may have brought up. Use the official register of accredited CBT therapists in UK and Ireland, or the directory of chartered psychologists to find a professional. Alternatively, visit your GP. An internal safe space is a vital tool to help you recover from past trauma, and to cope better with daily life dealing with autoimmunity. By practicing the exercise over and over, you can get to your designated Safe Space quicker – and you carry it inside you wherever you go, meaning it’s always something you can rely on in a crisis. Imagine somewhere calm and special to you – it can be an imaginary place, but I usually suggest somewhere in nature, so: a forest, the beach, a meadow, by a lake. Make sure your chosen space is calm and you are alone. Consider your senses. What do your surrounding sound like? Are there birds or insects making noise? Can you feel grass or sand under your toes? What temperature is it? What can you smell? These questions are important, as the details help cement your space in your mind. Take note of how you feel right now, and where the feeling seems to be in your body. Practice thinking about your safe space. The more often you think of it, the easier you’ll find to return to it. With repetition, you should be able to call up the feeling of being in your safe space throughout the day. The following exercise is a great way to establish some inner strength, which is important when dealing with everyday stress – alongside the worry of an autoimmune disease. I always recommend combining it with one or more other methods in order to deal with your unresolved emotions much easier. Many of my patients ask me if they have to go on antidepressants in order to heal. While certain medications can be beneficial to modify your relationship with trauma short-term, you may feel reluctant to give them a go. Fortunately, there are many studies being conducted all the time on different methods to improve symptoms of PTSD and trauma. So it’s not always necessary to take antidepressants, unless you wish to. Please always discuss this with your primary care physician / GP. Transcendental meditation – While meditation remains a little out there for many people, it has a host of benefits to your health, and now studies show that meditation can significantly help those suffering from PTSD. Emotional freedom techniques (EFT) – also known as tapping, EFT uses Meridian points much like acupuncture, and focuses on healing your body’s energy flow. Studies show that EFT can be effective when practiced by patients with PTSD. Yoga – exercise is beneficial if you are struggling with trauma, but yoga in particular is a great form of physical and mental therapy combined. Yoga is much more than just moving your body, and it is beneficial to those with PTSD and autoimmune diseases such as multiple sclerosis and arthritis. Dance therapy – dancing may seem frivolous but it is an excellent way to get endorphins moving through your body, and it has been clinically proven to aid PTSD recovery. Nature – being out in nature is crucial to both mental and physical well-being, and imagining a natural place in your safe space exercise relies on aspect. Natural surroundings are a linchpin to PTSD recovery. Compared to the other methods, gratitude may sound a little basic, but it can be quite challenging if you’re used to pain and emotional turmoil. Everyone practices gratitude differently, but try keeping a notebook and listing 3 positive things that happen during the day. Your positives may be small, such as a good cup of coffee or experiencing pleasant weather, or that someone paid you a compliment. Sitting up and taking notice of the good things can aid PTSD recovery. Alternatively, you could write down one positive thing a day, fold it up, and keep it in a jar. As the notes build up, you have a calming tool to look through when you feel like you can’t cope. Some of these methods are simple enough for you to incorporate into your daily life. Others, such as yoga and transcendental meditation, may involve consulting an expert, someone who can guide you through the process. Please remember that these methods are only a part of your overall recovery plan. With my patients, I spend a while going over their dietary habits and adjusting their food plan. We also examine other changes that can be made. You can of course change your food habits and start your emotional work at the same time, but I would caution you against making too many changes all at once. Where I would love to have my patients improve all aspects of their lifestyle right away, it’s important that we tread carefully because autoimmune compromised individuals have heightened sensitivity. The process is a learning curve: allow yourself to feel your feelings, but start small. Work up to the big things. Remember, it takes time to process emotion – a lot longer than you may expect. There are a number of exercises you can try in this Psychology Today article. You may need to work on parts of your behaviour that have arisen in response to ACEs. Often, these experiences shape our reactions and stress response to the everyday. You may find that as you begin to work on yourself and heal, you may meet resistance from some of the people in your life. As time goes by, you may need to remove the adult relationships that are a continuation of your abuse or trauma. Cutting out toxic relationships where applicable is a huge and healthy step. In order for CBT and the other methods mentioned to work fully, you need to go all in. You should be prepared to do some heavy lifting, emotionally speaking, and you may find it difficult at times. But it’s rewarding in terms of nurturing yourself and healing both your mind and your autoimmune disease. And you don’t need to do it alone. If you require one, find a therapist or psychiatrist who specialises in trauma work. I have faith that you can succeed, you can improve your health from the inside out, and go on to live your life the way you’ve always wanted to. If you’re affected by any of the issues described in the article, please contact the Samaritans, call 111 for out-of-hours NHS advice, or see your GP for further guidance. HAVOCA and NAPAC are also useful organisations for survivors of abuse. If you’re suffering from autoimmunity and feeling ready to beat your stress and trauma, and also to improve your health, check out my course The Foundations of Health.